From the original Godzilla to the myriad monstrosities of Guillermo del Toro's Pacific Rim, giant creatures have been ravaging our world in countless comic books, movies, and television shows for years. But while many of these stories have focused on how to get rid of the monsters, the new web series Enormous takes a different approach: how do you survive in a world with them? Based on an Image Comics property by writer Tim Daniel and artist Mehdi Cheggour, the Enormous series focuses on a UN search and rescue team tasked with finding abandoned children. In addition to the monsters, the world has also been plagued by a horrific virus that's forced humanity to the point of extinction. Needless to say, the group faces some pretty enormous challenges, and that's what makes the pilot episode (featured above) so interesting. Written and directed by BenDavid Grabinski, and co-written with Andre Ovredal (Troll Hunter), the pilot episode of does a great job of introducing the world of Enormous and our main characters. It also looks great, boasting impressive production values that are not often seen in web series. To learn more about how this project came together, Screen Rant interviewed Enormous producer Adrian Askarieh. We also talked a bit about his other projects, including status updates on Agent 47 and Deus Ex. SR: What attracted you to Enormous? Adrian Askarieh: On a basic level the art by Mehdi Cheggour was unlike anything that I had seen in a while. There was a level of realism to it that immediately drew me into the world and the characters, but ultimately what Tim Daniel has done with the concept and the story felt tailor-made for an adaptation. Not to over simply it, but I look at "Enormous" as "The Walking Dead with giant monsters"
SR: What's appealing about producing a web series, in comparison to feature films? It really has the same set of challenges, which consist of: developing it, getting it financed, finding the right filmmaker who shares your vision, getting the right cast for it, and ultimately getting it produced and distributed properly. Although in this medium the distribution component is available to anyone with a computer or a smart phone, we wanted to align ourselves with a significant online partner which is why we approached Machinima. And Machinima backed us all the way. SR: Are there plans to take Enormous beyond the web? Absolutely. That was the goal from the very outset. We look at the Enormous short and the digital series as only the first component, and the "launch component", if you will, of the much larger Enormous universe, which we hope to explore in features, on TV, and in the interactive game realms. SR: How was it partnering with BenDavid Grabinski and Andre Ovredal on this project? I was a fan of both when I approached them for this. "Troll Hunter" is a really inventive and fun film and Andre was actually set to direct Enormous before scheduling conflicts made it not possible for him to do so. He wrote two or three drafts of the script that myself, my producing partner on this, Josh Wexler, and Machinima all felt gave us the blueprint for the short. It was faithful to Tim's and Mehdi's book but it also created its own identity. When Andre fell out, it was very disappointing. But then if not for that temporary setback, I would not have approached BenDavid whom I have a hard time imagining Enormous without. I was a big fan of his short "The Cost of Living" and thought that he had an interesting perspective on the action/sci fi genre. To use a well known film analogy regarding the casting of "Raiders of the Lost Ark": if Andre was our "Tom Selleck", then BenDavid is our "Harrison Ford". BenDavid came in rather late to the project and had the formidable task of a short Prep time, a complicated shoot, as well as a short VFX-heavy post production period for what is one of the more ambitious projects ever to have been produced for the Web. He did an extraordinary job and I could not imagine pulling this off in the manner in which we did without him. I think BenDavid will have a huge career ahead of him as a filmmaker. SR: What should fans expect to see from Enormous over the course of the series? Hopefully more good stories. I think we have established a strong and interesting group of core characters with the Enormous short. We all want to see what happens to them on their journey to survive what has happened to the world, and their own attempts to save it. It very much embraces the "Lost" and "The Walking Dead" model while being entirely its own thing. We have so many places we want to take our characters and so much of the Enormous world to still explore. SR: How is progress coming on Agent 47? Very good. We are in our 4th week of production here in Berlin. We have a great cast led by Rupert Friend and Zach Quinto, a terrific director, and a story we are very excited about. I think (and hope) that we are entering a new era for Agent 47 in movies. SR: What's the status of Deus Ex? It is moving forward at CBS Films. I have personally never been part of a project where there is so much interest from both video game fans and casual movie fans alike. I think "Deus Ex" has the potential to be something very special. I'm producing it with Roy Lee and I think we will be making it this year. SR: Both of these films are adaptations of video games, which seem to have a reputation for being challenging to pull off well. What do you think is the secret to a good video game movie? They are only challenging if you go into them thinking of them as anything other than an opportunity to tell a good story and create a world and/or characters audiences will want to care about. The problem with video game adaptations has been that majority of those who make them tend to think of them in terms of a licensing deal. What I mean is that once they have the rights, it's all about throwing a story that sticks to the wall. Video game movies are not that different from comic book movies. They need to be made by people who understand and respect the properties and don't come to it in a cynical way. We all know the state of comic book movies before the first "X-Men" in 2000. Video game movies are no different. I think with AGENT 47, DEUS EX, WARCRAFT, ASSASSINS CREED and some of the key other ones looming, we are hopefully entering a very potent time in terms of video game adaptations working on a big level. 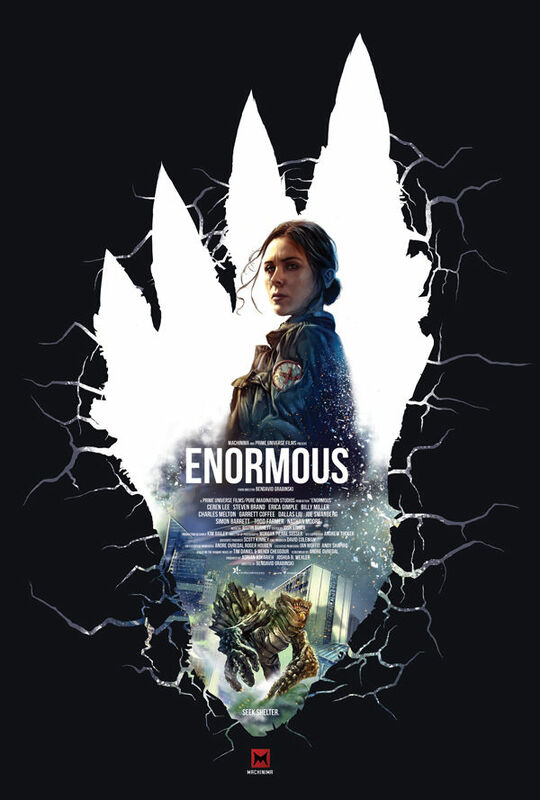 You can watch Enormous exclusively on Machinima.